OM is a duo from San Francisco, California, United States, formed in 2003 by the rhythm section of the disbanded stoner metal band Sleep. The band’s first three albums feature Al Cisneros on vocals and bass and Chris Hakius on drums. The band’s music is similar in structure to Tibetan and Byzantine chant and is rich in rhythm and melody. Their music and lyrics lift off at the beginning and slowly mutate giving a feeling of evolution inside each song. The vocals have a monotone quality, producing, on some tracks, a noticeable hypnotic effect of the sort that tends to be appealing to the devotees of the many various genres of druggishly-bent, “space” music – but which not all music calling itself stoner rock necessarily is able to cause. On January 2008, Hakius left the band and was replaced by drummer Emil Amos, of Grails. In 2011 Robert Lowe (Lichens) joined the group. 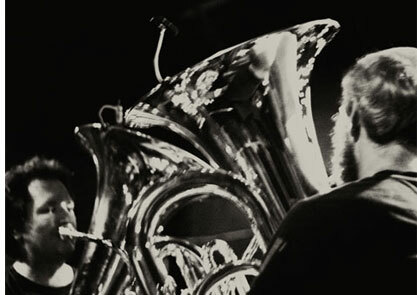 Just three years into their dual-tuba project, Birmingham’s ORE continue to evolve rapidly. From early drone/doom beginnings their music has lately drawn inspiration from Indian classical music and other improvisational influences to become something much more difficult to define. Autumn 2013 sees them celebrating the release of their new double A side 7″ in collaboration with Japanese noise master KK Null on Endtyme Records (a record born from their Supersonic 2012 collaboration), and for this performance they will be joined on drums by regular live collaborator and jazz percussionist Lydia Glanville.